Two new Roads will be completed in two years - STRR Satellite Ring Road bypassing Bangalore and Hosur to ease the traffic congestion on the nh 44, nh 7 . 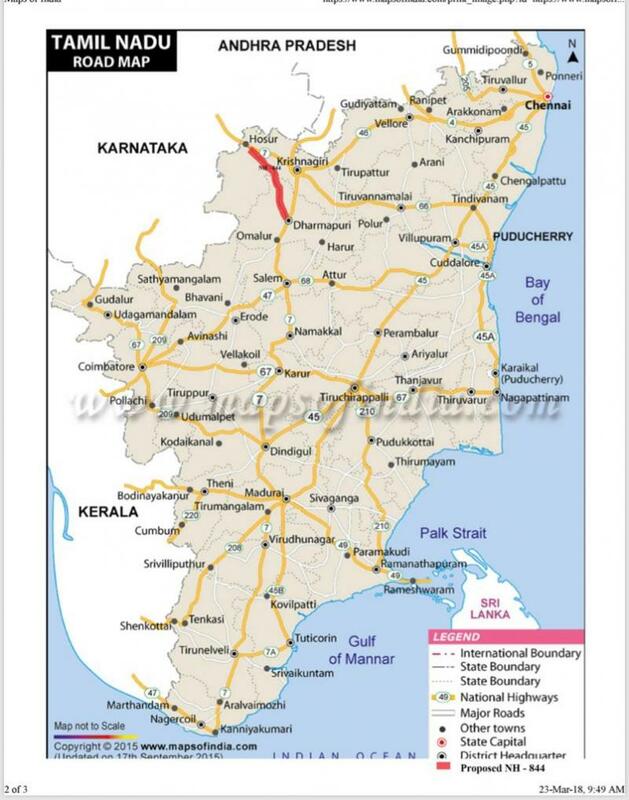 Vehicles from Andhra, Mysore , Poona can bypass Bangalore and Hosur. For Latest News Click here. Chona Property Management Private Limited, Chennai and Bangalore shall manage the development, construction & operation of the mall complex. First time in Hosur and in the Districts of Krishnagiri and Dharmapuri. Shopping Mall : Brand Name Shops. Central Atrium : for Performances, Presentations, Launches. Hotel:about 40 rooms (3 star category). Food Court: with Branded Food Outlets. Multiplex: with 3 or 4 movie screens. Car Parking: adequate car parking for all services. GMR Krishnagiri SIR at Hosur, Krishnagiri district, Tamil Nadu is the upcoming and the most ambitious project of the GMR Group spread over 4300 acres of land. The project site is strategically located on the proposed Chennai – Bangalore Industrial Corridor and is 290km from the port city of Chennai and 2 hours drive from Bangalore International Airport. Real Estate Scenario in Hosur. Hosur is a mere 23 km away from Electronic City, Bangalore's IT hub, and the Tamil Nadu government wants to make the industrial township a giant satellite town like Gurgaon or Noida. 4000 acres has been identified in Hosur for Industrial Zone. CM said new manufacturing zones will be set up with adequate infrastructure to provide a competitive business environment. 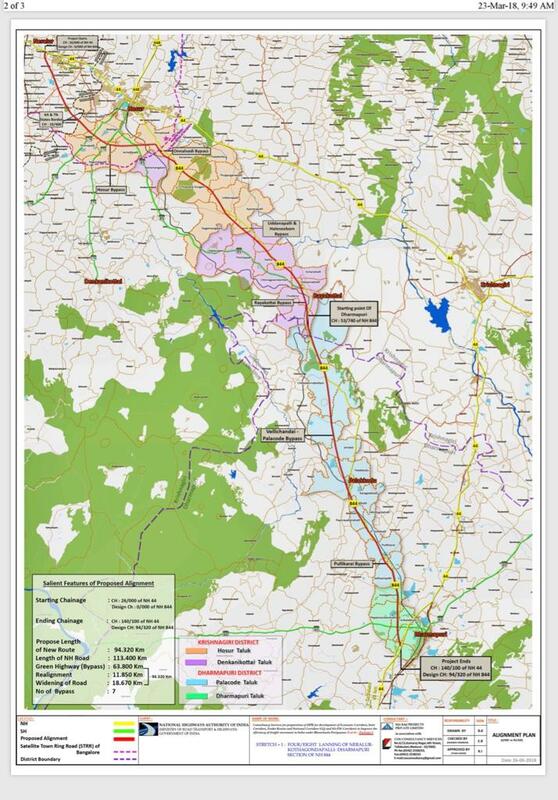 Initially, the zones will be set up in Hosur of Krishnagiri Dist (4,000 acres). A special purpose vehicle will be set up in each of these zones for the better management. The Electronics Corporation of Tamil Nadu (ELCOT) has formed the IT SEZ park at Hosur in 190 acres the largest in Tamilnadu. And GMR Infrastructure is planning to setup a 2600 acres of IT AND ITES and MULTIPRODUCT SEZ one of the largest in South India. Already about 30,000 people working in Electronic city are located in Hosur. They travel daily by Pool Vehicles, Staff bus from Wipro and Mini cabs from IT co's. Hosur, he says, has been chosen as it can dovetail the strengths of Bangalore's deep talent pool and salubrious climate with Tamil Nadu's infrastructural forte and relatively inexpensive real-estate rates. Making Hosur an IT hub, however, will be a tough task. In 2003-04, when Tamil Nadu exported Rs 7,643 crore (Rs 76.43 billion) worth of software, Hosur's contribution was zilch. Tamil Nadu is keen on changing this. "We will consider building a 250,000 sq ft facility, on the lines of TIDEL Park in Chennai, at a cost of between Rs 35 crore (Rs 350 million) and Rs 50 crore (Rs 500 million). This initiative, has created a light-house effect and boost investor confidence," Harinarain says. He says the Tamil Nadu government is likely to use a private-public partnership to upgrade Hosur's present infrastructure, including schools, hospitals and shopping malls, to build Hosur into a viable satellite town. The state government will provide all supporting infrastructural requirements such as land, sewerage, electricity and water. "With a TIDEL-type park, Lots of residential complexes will be thrown in between Hosur and Bangalore. Travel time is faster outside Bangalore to Hosur rather than within the city," says K Pandia Rajan, managing director, Ma Foi Management Consultants Limited, the recruitment agency. It is not as if Hosur doesn't have anything other than its proximity to Bangalore going for it. It has been an industrial hub for more than two decades now and home to the manufacturing plants of Ashok Leyland, Titan Industries, TTK Prestige, Reckitt Benckiser, Hindustan Lever, Carborandum Universal and TVS Motors. So, the basic infrastructure is firmly in place. "Hosur's potential to become a prime outlying suburb of Bangalore, on the lines of Noida and Gurgaon for Delhi and Navi Mumbai for Mumbai, has been largely under utilised. IT majors such Infosys and Wipro are just a stone's throw away in Electronics City which is midway between Bangalore and Hosur. These companies would be wary of setting up operations in Hosur as they are already battling the Karnataka government over the lack of proper roads to Electronic City from Bangalore. If anything can stop Hosur's advances to becoming a IT super city. However, real estate prices are 25-30 per cent lower in Hosur than in the areas of Bangalore closest to Hosur. What do the software companies think of Hosur? "We are not considering Bangalore or Hosur as of now. But assuming that we were, the primary concerns would be travel time, overheads and the cost of attracting talent," says Arun Jain, chairman and CEO, Polaris Software Lab. A Reality Scenario of Hosur - An article by A.Lakshmanan, Maruthi Housing, Hosur. Hosur, also known as Little England, for its climatic conditions, has a history of more than 825 Years. 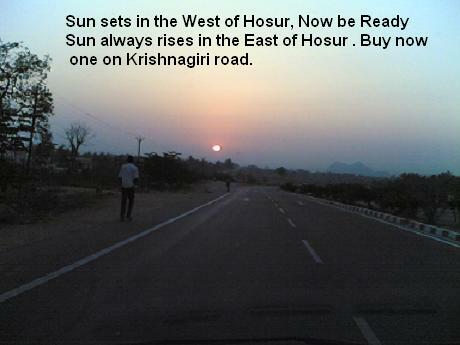 Hosur is at the height of about 900 meters above the sea level. The average temperature during summer: 25° to 30° C and during Winter: 13° to 25° C.
Languages spoken is Tamil, Telugu, Kannada, Hindi, Urdu. Hosur was first developed by Tamil Nadu government’s Nodal Agency SIPCOT in 1983 has been a catalyst in the development of medium and large scale industries in Hosur. Sipcot has helped faster industrial development in backward and underdeveloped areas and ensures that dispersal of financial incentives spurt in growth in backward and hitherto under developed areas. About 2500 acres and Almost all Industrial Giants like Ashok Leyland, Hindusthan Motors, Lakshmi Mills, TVS, Carborandum, TITAN and 750 Large Industries , 90 small industries, 650 tiny ancillary industries are already here in place and made this small town into a Big Industrial Town of Tamil nadu. The Friendly Government, plenty of talented work force and cheap labour all over from tamilnadu, Low land rates, salubrious climate when compared to Bangalore, good Rail, NH7 Road connectivity (on the Golden Quadrilateral) to Ports, Airports of Bangalore and Chennai made these projects a Mega Success. About 23 Educational institutions like CBSE schools in large campus of ZEE, Sishya , TITAN, TVS, Ashok Leyland, Maharishi Vidya Mandir, St.Joseph, Seventh day Adventist, Veda Vidyalaya, Velankanni , Gurukulam, Stanford Pubic school, Chaitanya, Birla school and many more are having enough infrastructure to serve the future projects. Colleges – Adhiyaman Engineering, MBA, Para Medical, Arts and Science in an area of 500 Acres, PMC tech in 150 acres, St.Joseph Womens College, Govt. ITI’s are creating more and more technical, administrative talent peoples to the industries. St Peters University and Medical College is another attraction. TNAU Tamilnadu Agricultural and Vetneray University and Poultry College in a 500 acre campus. Residential – The TamilNadu Housing Board has already developed and sold out about 1000 acres of Residential projects - one of the biggest Housing project of Tamilnadu and now constructing over 1000 units in 2018. Health Facilities – Sparsh Trauma care and ESI Hospital, Narayana Hirudalaya at Hosur and Chandapura – 15 km from Hosur. Agarwal eye hospital and 15 private hospitals Cauvery Hospitals, Gunam Speciality Hospitals, Chandrasekara Hospitals are the some of the 100 Bed Multispeciality hospitals, 2 charity and 1 govt hospital. A 100 Bed Medical hospital is getting ready at the St Peters Adhiyaman Medical College . To change Hosur now into a True Megopolis - Now No body can Stop this happening. All these days it was only the spill over of Bangalore was occupying the Reality market in Hosur. But in the present scenario, Industrial Giants and MNC’s like GMR, Kansai Nerolac, Mega Project Developers from Bangalore, Hyderabad, Chennai, NRI’s are flooding the market to buy several 1000 of acres of land. Under the Central Government UDAAN Scheme TAAL has been permitted to operate a Domestic Airport which could attract all Electronic City Travellers and Industries . The Railways planning a Goods transit point inside SEZ of Bairamangalam, AUTO hub for Distribution. Telco, TATA, Bajaj, Mahindra, Leyland are having Yards for Distribution to South. A Ring road connecting the North of Hosur with NH7 which will be implemented shortly. The Japan aided Mega Hogenakkal Drinking Water Project to supply water to Hosur – Dharmapuri Krishnagiri Dist., has helped to balance the water requirment . To Plant More trees at the Hosur Cattle farm (Stud Farm) commissioned by Tiipu Sultan and later by the British in about 1400 acres and now there are plans to upgrade into a Botanical Garden in the lines of Lal Bagh in Bangalore- to retain and improve the present weather and climate and Govt has handed over to the TNAU and various department to maintain and improve the Green Belt of Hosur. The Bengaluru Metro project from Silk Board till Bommasandra on completion in 2020 will help Hosur as the Sattlelite City of Bangalore . Not only Electronic City People , even other employees from Bengaluru will Prefer their Homes in Hosur and will be the best choice to own a Dream Villa in Just 30 min Reach from the city Centre. More Infra structure like wide Inner ring road for the north side of Hosur, Outer ring roads connecting all state highways around Hosur and few more fly overs. To improve the present lakes – about 100’s of lakes around hosur are in place for good rain water harvesting. Provide Under Ground sewerage to all areas, Sulab Public toilets, Well planned Water supply, Garbage Dumps, Public Parks, More Shopping malls. Medical facilities – To improve the ESI hospital, Build more Multi speciality hospital and Full fledged Trauma care centre. To Commence one more Bus station for the Mofussil buses. To Prepare New Hosur Town Master Plan and organize the present developments. Will it be a wise investment. Yes, of course. The Techies and the NRI’s are already flooding to buy one through their relatives and friends and invested in many Residential plots and Villas in Hosur. Vakil’s Hosur Hills – A Villa project was a great success and more new entrants to hosur are from Bangalore – Vakil, Upkar, Aswani, Nigama, Little England, Swarna bhoomi from Coimbatore, NCL homes from Hyderabad. Apart from this Local Players who are settled in Hosur from 1990’s: Maruthi Housing – Green Fields Villas in 40 acres, in the year 2000: Thirupathi Construction – Individual houses and apartments, In 1983 : VGP Layouts, in 1995: Titan Township Villas are also playing a vital role in developing Hosur and giving a tough competition to the new comers in property prices. As the Rental is still cheap Rs.10 per sq.ft., and Culture is Intact, many techies who are from the deep south prefer hosur as the Safest Haven for their lively hood and commute daily to Bangalore Electronic City which is just a few minutes drive. Also many South Indians especially NRI’s , Retired Officials who worked in other parts of India who wants to move back to their home town, High level Administrative Managers and Engineers of the Industries in Hosur prefer their retirement plans and stay in Hosur – a cosmopolitan Town for its close proximity and similar and Better weather to Bangalore and easy access to Chennai. 11.1 This proposal involves SME units of Engineering Cluster at Hosur, mainly engaged in fabrication of Auto components. Hosur Small Micro Engineering Components Private Limited (SPV) and Commissioner, Govt of Tamil Nadu made brief presentation about facilities required for setting up of CFC. SPV member explained that all legal expenses, documentation, etc. which are incurred prior to in-corporation of SPVcompany (by SPV members) are treated as pre-operative expenses. Expenditure done thereafter, till the CFC is set-up and starts production, are considered as preliminary expenses.11.2 After discussions following decisions were taken:-(a) Area for laboratory & administration block be reduced from 8580 sq. ft. to 6000 sq. ft., thus the total building construction area works out to 16100 sq. ft. instead of 18680 sq. ft. and the revised cost will be Rs.83.79 lakhs.Agenda Item No. 4: Proposal for setting up of Common Facility Centre for Engineering Cluster (Auto components), Hosur, Tamil Nadu. New Investment in Hosur Rs 4,000 crore from Delta India Electronics — a major electronics and electricals manufacturer. The Park is jointly developed by the Tamil Nadu Industrial Development Corporation (Tidco), Electronics Corporation of Tamil Nadu (Elcot), Software Technology Parks of India (Stpi) and Tidel Park, Chennai. With the state government actively promoting IT and ITES in Tier-II cities, Elcot has also embarked on developing SEZs in cities such as Madurai, Trichy, Tirunelveli, Salem and Hosur. Elcot would has constructed a campus in Hosur. Apart from housing IT and ITES companies, Tidel Park will have commercial shops catering to the needs of the employees. "Right from cafeteria to saloon to banks, nearly 1 lakh sq ft area in the ground floor will have all such facilities," an official said, adding Archies had already booked space under bookstore facility.